The park gets its name from the large sloping waterfall that cuts through the park. Getting there: From Austin head west on Highway 290. After near 30 miles turn north on RM 3232. Continue north until 3232 dead ends into a T-section in the road. The entrance to Pedernales Falls State Park is to the right off of FM 2766. The ranger station for paying park entrance fees is a bit less than 3 miles north of the park entrance. 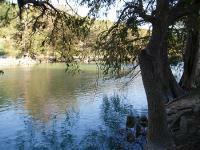 The Hikes: Pedernales Falls is one of the largest and interesting parks to be found in the Central Texas area. 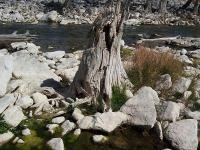 With over 5,000 acres it includes a reported 20 miles of trails, scenic views, camping areas and a dramatic waterfall. The remains of a homestead and rock fences can be be found along the park's trails. 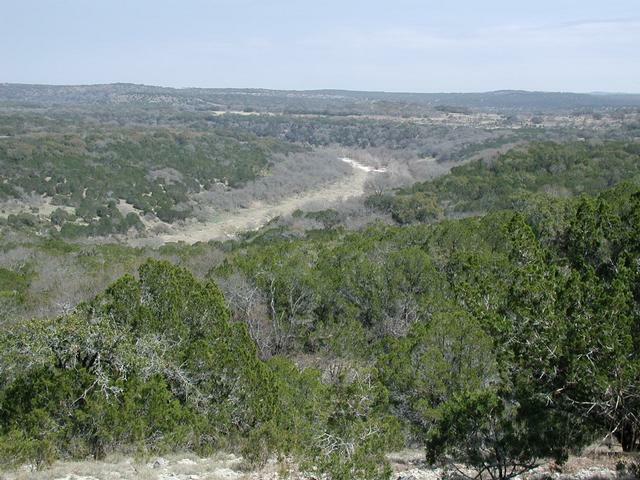 The land that makes up Pedernales Falls State Park once played host to ranchers and signs of their presence remain in the park to this day. 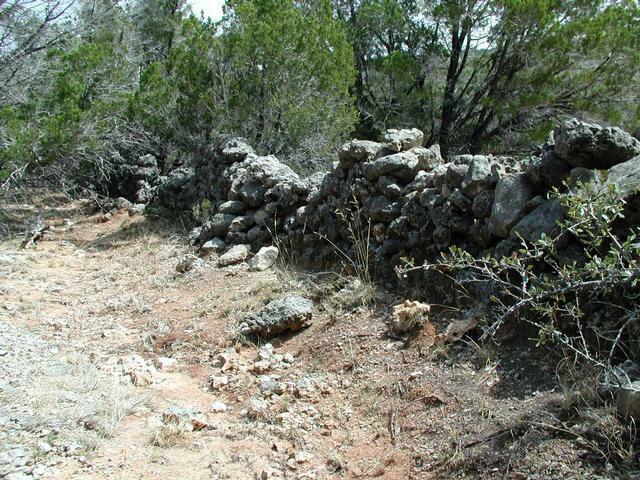 One can find the remains of ranch houses, rock walls and even a settler cemetery. 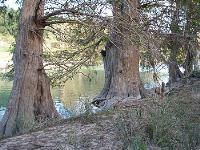 The park features one of the larger camping areas in central Texas. The primitive camping area can only be accessed by hiking a couple of miles from the Wolf Mountain Trailhead, so you won't find yourself camping next to someone's motor home outfitted with air conditioning and satellite TV. Trails in Pedernales Falls State Park include numerous river and creek valley views. Most people visit the park for the waterfall that gives the park its name. 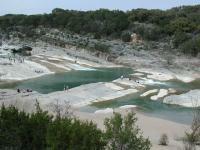 Large crowds of people may be found walking up and down the shore of the Pedernales River exploring the various rivulets and crannies of the waterfall system. The trails in the park range from the short Falls Trail to get to Pedernales Falls to the challenging Wolf Mountain Trail that draws many hikers to the park. 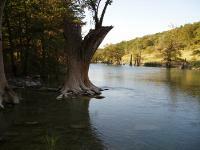 The 4-Mile Loop trail crosses the Pedernales River to the seldom visited east bank portion of the park and provides some of the best solitude to be found in Central Texas. My boyfriend and took the afternoon off to spend the afternoon playing in the park. We only did the hike around the falls and the four mile loop. The unmarke braided trails, are a bit confusing, but it's impossible to really get lost and the views are worth it. The four mile loop is a nice flat hike with moderate shade and a few elevation changes make it a nice workout. The trail is wide and had been bladed which isn't a good thing in my opinion, but makes things easier for a large group. Would be good for a picnic. Points of interest: the river crossing at the the beginning of the like (and at the end when you walk back out) and small group of old graves. It looks like there used to be a sign pointing them out, but it's no longer there. You can see the decorative fence surrounding one of the graves from the trail if you're paying attention. I brought my Lab, Tido, to the falls and we spent most of the day just lookin around. He very much enjoyed it, he did have a little trouble running on the rocks cause he twisted his ankle twice but he's only a puppy. In addition to the designated hiking trails, there are at least 12 miles of equestrial trails not included on the normal park map. If you ask real nicely the folks at the headquarters will give you a very cheesy map of them. Photocopy of the normal map with the horse trails filled in with a felt tip marker. Starting from the birding blind (just outside the horse corral area) I went through the corral area and got on the trail where the sign marks "Gunney's Horse Trail". Everywhere else this trail is labelled as the South Loop and the Short Loop. It's a long narrow loop trail with a cutoff in the middle that forms the Short Trail. Unlike the Wolf Mountain trail, the equestrian trails are generally unimproved, though they sometimes follow Jeep tracks. No asphalt or other nastiness. Starting out, the trail was very muddy (it rained the day before) but after 1/2 a mile or so things dried out and got better. It stayed that way until the last half mile or so of the return trip. The last 4 or 5 miles are spent walking next to the park boundary, which is marked by an 8 foot tall fence. This wasn't as unpleasant as it sounds, but it wasn't nearly as nice as the much more pristine terrain that the rest of the trail followed. A little ways before encountering the fence the trail crosses the park road just inside the front gate. It might be worth setting up a car shuttle to avoid the fence walking, especially if you aren't really interested in the full 11 mile round trip. I've now hike the full length once and the portion starting at the Wolf Mountain trailhead (~7 mile loop) and not seen anyone else on the trail. That includes a visit on Memorial Day weekend when there was a line 6 cars long to get an entrance permit and the park was pretty much full up. They don't advertise this trail and the solitude is wonderful.